Journalists crowded into a room in the Archdiocese of Boston’s Braintree headquarters Dec. 20 as Cardinal Sean O’Malley answered questions following the death of Cardinal Bernard Law, whose death was officially announced by the Vatican earlier that day. The former archbishop of Boston, Cardinal Law resigned in 2002 amid allegations of mishandling cases of sexual abuse of minors by priests in the archdiocese. In 2004, the cardinal was named archpriest of a basilica in Rome, where he died at age 86. “This is a very difficult day for survivors and all of us in the Archdiocese of Boston and for me,” said Cardinal O’Malley at the news conference. “We have anticipated this day, recognizing that it would open a lot of old wounds and cause much pain and anger in those who have suffered so much already, and we share in their suffering,” he continued. “As the church must always do, we seek forgiveness for the sins of the past and for all the things that were done or not done that have contributed to the suffering of so many,” he said. 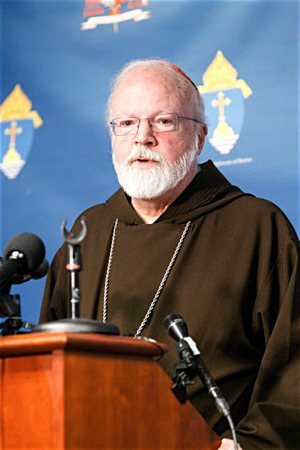 The archdiocese has a continued commitment to “provide for the assistance and support for victim survivors and their families, and to strive to maintain safe environments in all of our churches, schools, institutions, and agencies,” said Cardinal O’Malley, who succeeded the late cardinal as Boston’s archbishop. Asked to comment on Cardinal Law’s appointment as archpriest of the Basilica of Santa Maria Maggiore following his resignation in Boston, a move that many victims saw as almost a reward, Cardinal O’Malley said he doesn’t believe that would happen today. “I think there’s been enough growth and consciousness of this problem in the Holy See that that would not happen,” he said. “We tried to craft a statement that would be fair and, at the same time, sensitive to the particular suffering of people in the archdiocese,” he said. “Christmas is about healing, relationships and forgiveness, and a big part of healing is being able to come to grips with our own difficulty in forgiveness,” he said. “This is what the mission of the church is, to work so that everyone will go to heaven, but I am not here to sit in judgment of anyone,” he said. Labbe is a reporter at The Pilot, newspaper of the Archdiocese of Boston.